I came across this only today and I just couldn’t resist sharing my thoughts on it with you. I’m sure not what exactly H C Anderson meant by this, but it got me thinking about the way we live our lives. Sometimes all we do is ‘just live’. And that, according to the butterfly, my friends, is just not good enough. There are two key areas of our lives where we may be happy to ‘just live’, but it would be sad if we did that. 1. Work : Are you working for a living? It is a sad reality that many people due to their circumstances have no choice but to ‘work for a living’. In other words, they have to work to feed themselves and their families. For example, right now, there are people working on repairing the road outside our home. They’re poor, daily workers who obviously have no choice but to work in these hard and dirty conditions. But what of us who do have choices? Are we really enjoying the work we do or just ‘working for a living’? Recently I met a young woman who is working in a job she doesn’t like, for employers she has no respect for – in fact, they treat her with little respect too. But she’s too scared to move out of this job because she’s afraid she won’t get another opening at the same position and pay. She’s a smart young woman who is just selling herself short. Is she ‘just living’? Just about…….. She has no freedom, no sunshine and certainly no little flower! So are you too ‘just living’ when it comes to your choice of work? Do you bring passion to your work? Or does it make you unhappy and dissatisfied? As Nick Williams, the author of Unconditional Success says: The work you were born to do will have joy in it; you’ll experience inspiration and it will flow from you. You’ll find it intrinsically fulfilling and nourishing. So in the traditional sense, it won’t always feel like work because you enjoy it so much! If our ‘work’ is not more than our ‘job’, then we are in big trouble. 2. Relationships: Have you settled down? One question I often heard when I was single was, ‘When are you planning to settle down?’. Being the smart-mouth I am, I would answer either with : ‘Why? Do I look unsettled?” or “I’m settled already – I don’t need marriage to do that.” It’s rather sad that the phrase ‘settle down’ has been associated with marriage. Here’s what the dictionary says about the phrase :to adopt an orderly and routine way of life, take up a permanent post, etc., esp after marriage. Perhaps some of us take the ‘settling down’ business a bit too seriously, especially in the context of our primary relationships – with our spouse, children, family. We don’t believe that we need to work on making our marriage or relationships meaningful. We tell our partners: ‘Since I’ve committed to live with you, I’ll do that – just live!’ Too often, I see couples who have forgotten the most basic reason why they’re together – love. We spend too much time nagging at and grumbling about our spouses, children and family. Instead of encouraging them to be the best they can be, we’re constantly finding fault and poking holes in their dreams. ‘You can’t clean up your room, and you want to be an event manager!’ ‘You’re so fat, and you want to become a model?” Whatever happened to – ‘You can achieve anything you dream of’ or ” You can count on me” or “I’ll be there, if you need me’ or “Go for it’ ? 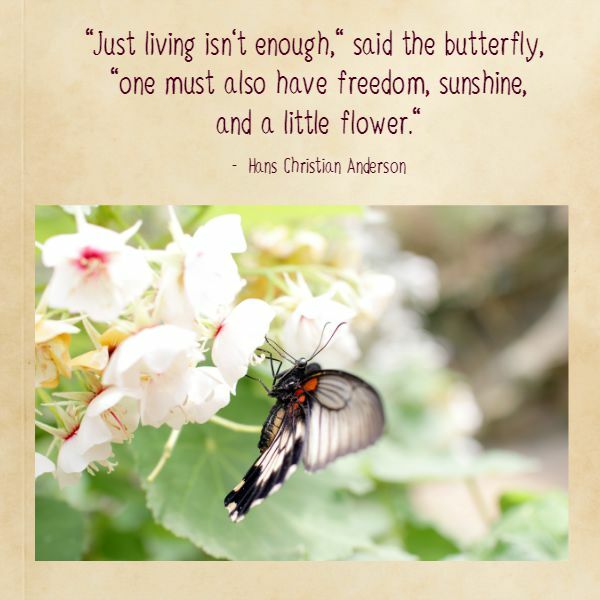 Let Mr Anderson’s butterfly spur you on to live a life charged with passion and meaning! Looks like some very good advice here – and your site has some great photography! love that H.C. Andersen quote. In terms of relationship, there's a funny bumper sticker I saw here in America-'wag more,bark less"